Don't you guys understand what his main problem is ? it's not his lack of minutes, it's his physicality , if you aren't strong, at least you have to be fast, if you aren't fast, at least you have to be agile, if you aren't agile at least you have to be smart, his stamina is poor as well. Small and short player doesn't have to be weak, look at kante or scholes for example, even if scholes mistime his tackles he would make sure to clatter each one of them and was painful to deal with. He lacks any of those attribute,afraid to tackle, can't take on player, get outmuscled all the time, slow and timid, in conclusion, he doesn't scare anyone. Offensively he is limited, defensively he is non-existent, till he fix that main problem of him , no amount of minutes and experience could help. I honestly believe it would be an insult to my intelligence to bother posting a meaningful response to this car crash of a post. Now the angry mob has hopefully subsided, let's acknowledge that young players will only ever develop if you give them chances, and accept they will make mistakes. It has always been this way, and will always be this way. Let's also accept that different players mature at different rates. I think it is easy to see that there is a talented player in there, whether he'll make it at the top is anyone's guess; but we'll never know unless we give him chances. And isolated games here or there do not count. The lad has barely played any football this season, and he's thrown into a game in the middle of the season and expected to perform at a high level. I wouldn't be surprised if he was shitting bricks. This thread doesn't even really need to be about Andreas. This thread is really about the attitude we adopt to young players in general. It is in our club's ethos to promote youth from our academy, yet large swathes of our fan-base are incredibly quick to write them off. I think we need to grasp the key assumption that if they are getting a chance in the first team, then the coaches are seeing qualities in them that may not be immediately apparent to casual fans. When I think of the list of players that have come through and been written off by fans, often in the harshest of terms, only to go on and become valuable players, it is pretty discouraging. It'll be lost among the absolute shambles of shite that's been written over the last few pages of this thread but it's heartening to read the odd piece of knowledge and understanding all the same. He’s pretty much finished here IMO. Was a big fan of him as a youngster but it became apparent to me from watching him at Valencia that he lacked the elite level dynamism needed to make it at a club like United and his footballing intelligence just isn’t razor sharp enough to make up for that fact. Some players are slow but they can make it up by being faster in terms of decision making and others make up for it through boundless stamina. Pereira just looks off the pace far too often whenever I seen him play. He has the odd good performance but nowhere near enough to justify the hype that has been built around him. He’s probably got one more game in him by the end of the season to prove himself and then he will probably be sold. If you’re still not able to make it under someone like Ole then you have no excuses. Sincerely hope I’m wrong about this as he is technically clearly good enough to play midfield for us but technique alone does not maketh the player. Mentally and physically you have to be able to compete. I was hoping he could be our Kroos but just doesn’t look like it’s going to happen. But we did give him chance. He was not good at the start of the season, was not good in the FA Cup and yet he still has his chance again and didn't play well, again. Should we give McTominay his minutes instead? And I don't think Andreas is a better player than McTominay. Sure he's better on the ball but at age 23 he didn't know his best position yet, while McTominay can evolve into a good destroyer mid with his work rate and strength/height. Remember at a top club like us, the minutes for youngster are extremely limited so the player needs to prove that they deserve those minutes. I also feel that Perreira didn't help himself with his decision making on his own development. Mourinho wanted him to stay last season and if he did so, he would be able to get some minutes in the Pogba roles with more focus on attacking contribution. And if he really wants to go on loan he should go to a team that can play him at his preferred position. What's the point of going to Valencia to play as a winger if you are not a winger? Anyway, calling people criticizing him "angry mob" won't help your argument look any better. Mourinho on Andreas: "I want to say one thing on Andreas Pereira. He was the right-winger at Valencia and comes to #mufc and plays a phenomenal match." His passing between the lines is just like Carrick. We've missed someone who does that. He also passes the ball quickly: it's so refreshing after a season of Matic taking 4-5 touches and then playing a sideways pass. Feels good to finally have a player that can wiggle out of tight spaces and pass a ball consistently. Brilliant today, was a bit quieter late on I think but it was after he picked up a yellow and he was getting stuck in a lot before that so it's understandable. Matic will have a job displacing him if he keeps it up. Thought he was excellent. Really calm and smooth on the ball. Great passing as well. Definitely deserves to be a part of this team and not just making the numbers. Very composed and mature performance. Definitely something to build on, would like to see him given another chance against Brighton. I didn't think he a put a foot wrong. Immensely calm under pressure and distributed the ball very well. MOTM for me. His passing is exceptional. Im not even talking about the long range ones. The short ones. Plays it in front of the player, its so important but understated. Sets rythm and speeds up play. Composed and great awareness. Faultless. He played very well, always looking to switch the play or pass between the lines. Hope he keeps his place for a few weeks at least. Excellent. May be our surprise player of the season and a midfield of him, Matic and Pogba should be our first choice atm. Fabulous performance, so assured on the ball against a decent midfield. Loved that tackle for the booking when he clearly got the ball. I’d prefer him a further 5 yards forward as he sat in between the 2 centre halves at times, and I think that would have helped push us forward a bit. Be interesting to see what/how we play when Matic comes back in. His passing is brilliant. Looks very comfortable pinging it around, same as Fred actually. Great performance to build on, hopefully he gets his chance to do so this season and he doesn't end up on the fringes once Matic is back. We have some player in our hands here . Fantastic tonight . Special mention from Jose, fully deserved. His long range passing is excellent. Did very well physically. I'd love to see him ahead of a DM and behind Pogba. He's a ball playing midfielder. He likes to move the ball quickly between the lines and press forward. He has 3 problems to overcome. He's not great defensively, he didnt show much mental strength on Tuesday, and perhaps most importantly we already happen to have arguably the world's best at the job he likes to do. I used to think he could be a Matic/Herrera replacement but he always looks a bit lost when we're not on the ball. I sometimes feel that such forums are simply not really fit for purpose if you are seeking good, qualitative debate. It seems a platform for some rather reactionary thinking and opinions. That's no criticism, more an observation, highlights social media in general really. I'm as guilty as any and I suppose we could all benefit from a little more thought at times. Pereira does seem a little short right now, across his game, and he has been at the club a while, so there are reasons why there seems to be questions around his game. The good thing is that I do feel that the level of attention , consideration and coaching now in place, and the different environment, will give the whole squad an opportunity to improve. He was asked to play as a winger but as you said it yourself "he's been deployed as a number 6, 8, 10 and as an inverted winger from the reserves to senior appearances" and "His best position is clearly considered as a number 6 otherwise even Ole wouldn't be playing him there" - So I assume that central/6,8,10 is his preferred position? So why didn't he go on loan to a team that helps him improve in those positions? Is there any way that we can say his loan spell at Valencia is productive? In all the quotes that you quoted, almost all of them praise his passing ability and I agree that he has good passing. That's why I think he should be deployed at Pogba position so he can show off his attacking ability (while have less defensive task) and we will be able to rest Pogba as well. If he stayed with us last year he would have that chance already for a decent period. I know he didn't have a crystal ball to foresee the Pogba injury but last year he was our second best creative CM behind Pogba, and it's clear that Mourinho wanted him to stay. You may think I don't like Andreas or think he's a bad player but I did not. My point is simple he was indeed given chances and didn't take it. Whether he should be given more chances or not is up to Ole. Personally, I would like to see McTominay more as a CDM, break down the game and pass it simple. Which players are these that United are disrespecting by starting Pereira? Are they at United already or are you making a conjectural argument? They don't even play in the same position. Pereira started over Fred, Mctominay and possibly Garner if you think he's ready to start for the first time. I don't think he is. He shouldn't even be starting ahead of Mctominay then. I am surprised that he is a Brazilian international already.. Maybe i am missing something but to me he reminds me of players from Bournemouth or Brighton. It is best if they can loan him to another club since he is only 22. Forgetting how he played for a bit I'm a bit disappointing in how afraid he seems to be of getting stuck in. I remember for the U23s he used to get stuck in and dish out rough challenges on a regular basis. Seems less physical than Mata for the first team. Andreas may or may not have what it takes to succeed at United, but it can't be argued that he's been given enough chances to prove himself here. Others have posted the numbers to support this point. I wish he had been loaned out to a PL or Championship club last season to get sustained experience with the high pace in England. His mistake against Burnley was partly on Jones, but partly on Pereira in not anticipating the instant pressure. This is definitely not true. Both Gomez and Greenwood are rated more now than Periera was back then. Both of these players are considered quite special when it comes to the academy in recent times. I however agree with you general point and look no further than Rashford. Virtually no-one expected Rashford to have made 100 appearances so soon and he wasn't all that in youth football. Pereira deserves more chances. I have no assurance. I'm saying it's time to give them a chance. Im sorry but I beg to differ, its just down to opinion I guess but I read a lot about Pereira at 19. There was a lot of excitement when we got him from PSV, just as much as there was when Pogba came from France. Average United followers who only casually follow the youth teams every once in a while only found out who Greenwood was recently when his performances were highlighted on social media. Players like Sylvan Ebanks-Blake and Mads Timm were even more hyped back in the day and I can only imagine how much more it would have been in this social media era. Im not knocking you down, but Pereira has been known and hyped up for a while now. He's older, more experienced with his loan spells and its his time to prove himself. This is only his first full season as a senior player at United FFS. You're basically saying the coaching staff are wrong in giving Pereira opportunities. Those kids will get their chances and they're not even like for like players. Gomes is not getting into this team for the foreseeable future. His position is taken up by Pogba. Pereira on the other hand has experience as a wide player and we are already using a wide player with midfield qualities. Pereira I would say can make a claim over Mata in this squad. No way I can accept Pogba and Pereira being put on similar footing in youth football. Pogba was a man against boys for all of his time in our academy and many thought him and Ravel were the most exciting prospects since Scholes (including me). 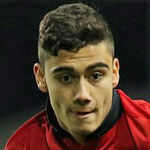 Yes Pereira is highly rated, and I watched him in the academy and thought the same (this guy can be a good player for us). It is all confirmation bias in here. Some seem to be desperate for him to fail just to prove a point. He has played very few minutes in an unfamiliar team since August, so it is understandable that he had a not-so-good performance in what was a tough a game for us. Why shouldn't he get more chances when other players get loads to prove themselves and to get themselves into form? Because he was not signed for big money, or because some are just desperate to see him fail? He has got the talent, just needs the time and it is amazing that some can't wait to confirm their biases after one or two games - bashing him and completely ignoring context. Nobody wants him to fail. We'd all much prefer if he was good enough and succeeded. He just isn't. It's not confirmation bias, it's simply that he isn't good enough. I've watched him for years and years and for much of that time thought he might have a chance but he just hasn't developed as well as we might have hoped. He was good enough for Grenada but not quite good enough to nail down a spot at Valencia. That sums up his level pretty well. As for having the requisite talent to become good enough, I honestly can't see it. He's got two nice feet but is too weak to protect the ball, his passing is inaccurate, he's not especially quick and so far he's completely froze whenever he's been given a chance in the first team. What are you seeing in him that others aren't? A few Cruyff turns and the fact that he used to take corners with either foot? It's hardly enough at this level. I didn't say they're wrong so no need to make stuff up regarding what I said. He deserved his chances. Was a promising player but not all promising players make it. From his chances it is quite evident he is really, really far from ever making it as a United player. My guess is the coaching staff know this too and wont be playing him as often anymore. He will probably get more chances to start or enter as a sub, not that he deserves it after his last performances, but our midfield is so thin that Ole will be forced to use him. All this people claiming he is so good but must play as a winger, what makes you think he can play there? He is as slow as Mata, may not be as weak as Mata but he definately is not a strong player. He doesn’t have the technicall ability to get past his man, for me playing him as a winger we will only have a worst version of Mata. Who by the way is not starting right now. Just because he played a few games for Valencia on the wing doesn’t mean he is good at it. If he’s going to get another chance should be playing as a number 8, in Pogba’s position, I don’t think he currently is or ever will be good enough for us, but playing him in Herrera’s role again is a shot to the face at least in Pogba’s role he may show one or two glympses of talent and will not cost us in the control of the game. Bottom line, has any one wonder why his contract expires in the summer, as has no approach from other clubs or why haven’t we offer him a new one? I mean we just gave McTominnay a new contract, its clear is not only the fans who don’t rate him much but the team as well. Hopefully he can end his career here giving decent performances, I think he tries way too hard to impress and end up complicating things, he should enjoy it and play simple. I think it will be the last time he plays for a top club. I'd be quite surprised if we haven't offered him one at all. But it'd be as a low level squad player, and he won't accept it because he wants to play. There sure be rumors at least if that had happened dont you think? We havent heard anything regarding a renewal. He's been hyped by people like you who know nothing about football and go on and on about the first game of the season or the pre-season tours. We have an option for another year. We will trigger that. Oh do tell us how it is all knowing one. Always good to have people that know more then us tell us how little we know..
Andreas is technically gifted but is not athletic/ strong/ enough for the elite level. If he was other clubs would have signed him already even on loan. In essence every other coach has done their homework on him and decided to pass. You do realize he just came off two back to back loans right? Yes they were in Spain, but im sure many British teams would've taken him. You mean like being loaned to a top 4 la liga side who wanted to sign him on a permanent? By the looks of things he's not travelling with the squad down to London for tomorrows fixture with Fulham. McTominay and Chong have both travelled. Shame, this actually would've been a perfect game for him to atone for his last performance. His confidence must be shot and there's no way he'll be in the squad for Liverpool, at least I don't think so.